Building Memories was one of the most beautiful cabins we have ever stayed in. It was very clean and felt like home. The view was great. We had the best time. Everything was easy the place was beautiful. We loved it. I didn't want to leave! We had a great experience. Phone calls and emails were answered and responded to quickly and professionally. It was the perfect getaway, and we hope to come back in the future!!! The cabin is beautiful, setting peaceful, nearby towns charming. Clean, good layout, beautiful setting on River, comfortable beds, lots of towels, nice kitchen with all the necessities. Enjoyed our stay. Thanks! Enjoyed the cabin. Guests did as well. We are a group of ladies who spend a weekend every fall in the mountains. This was the most beautiful, most well appointed and well kept properties weve ever stayed on. We have to go back again! Love the cabin and Mountain Oasis! 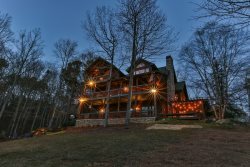 This is the second cabin we have stayed at in Ellijay and the third time renting from Mountain Oasis. All great! We loved our stay. Building Memories was perfectly located for our family. It was a little scary getting there, but well worth the drive. Everyone was helpful. Our cabin was beautiful, clean and well equipped. Mountain Oasis Cabins always have great properties with exceptional service.